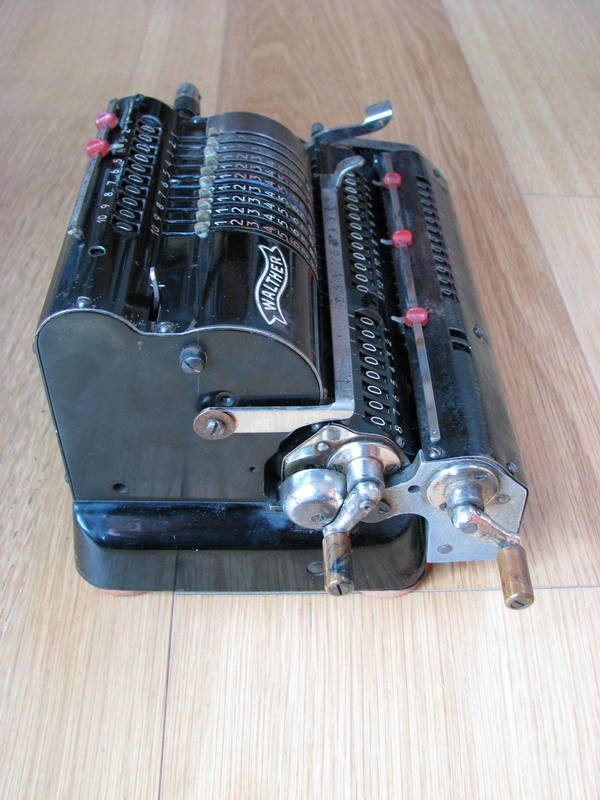 I acquired this machine in partial trade for my very early Brunsviga Nova III. It is apparently exceedingly rare. It is also rather clumsy, and doesn't really work properly. 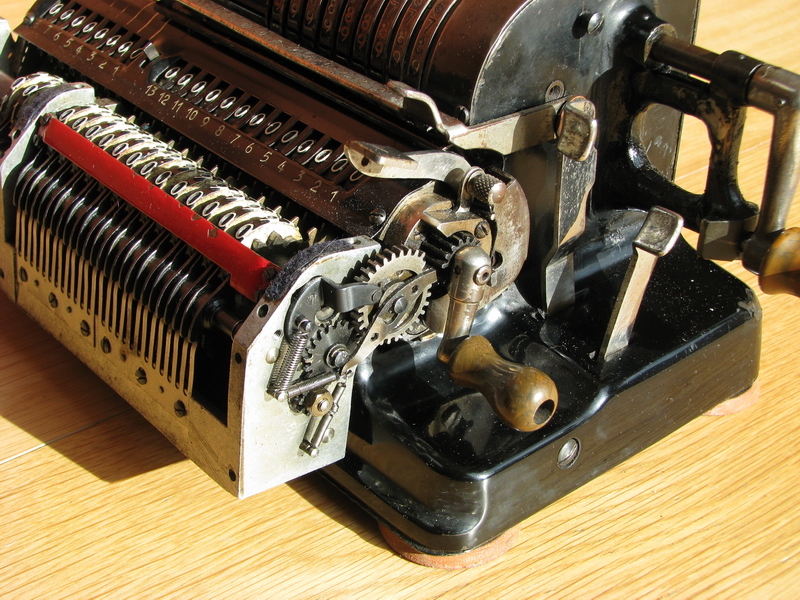 Another half turn done - we started a second turn of the clearing crank, the memory is now in the downward position, and the raised portion of the large gear is now engaged with the clearing crank, so this gear is still turning, and it is busy operating the tens' carry shaft at the bottom of the memory to effect the necessary tens' carries in the memory bank (without changing the 0's in the "normal" result register back into 1's where carries are taking place). 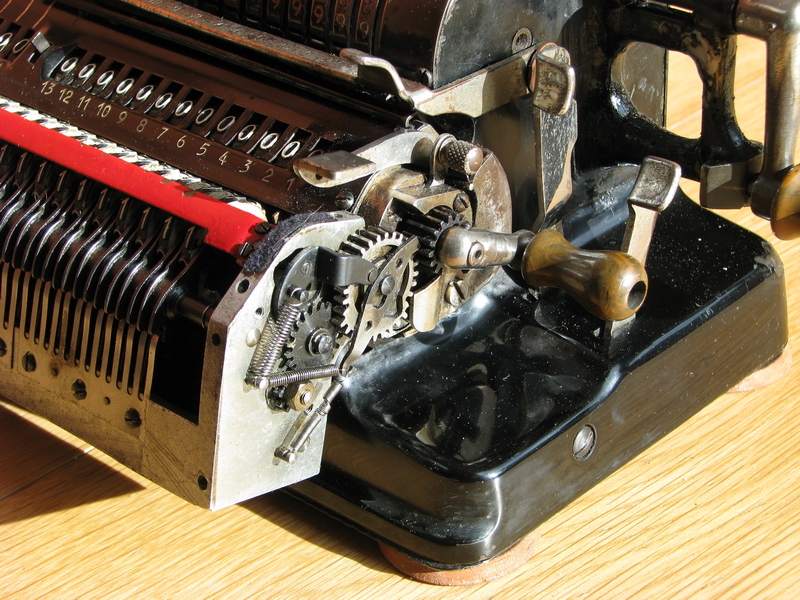 Finally, when we have turned past the raised section on the large gear, both it and the clearing crank snap back into the rest position, and the red blind comes down, revealing the result in the memory bank. The complete result transfer thus takes two full turns of the clearing handle. Take note of the fact that the numeral wheels in the memory bank are a special issue - they are oriented backwards with respect to the "normal" numeral wheels in the carriage. 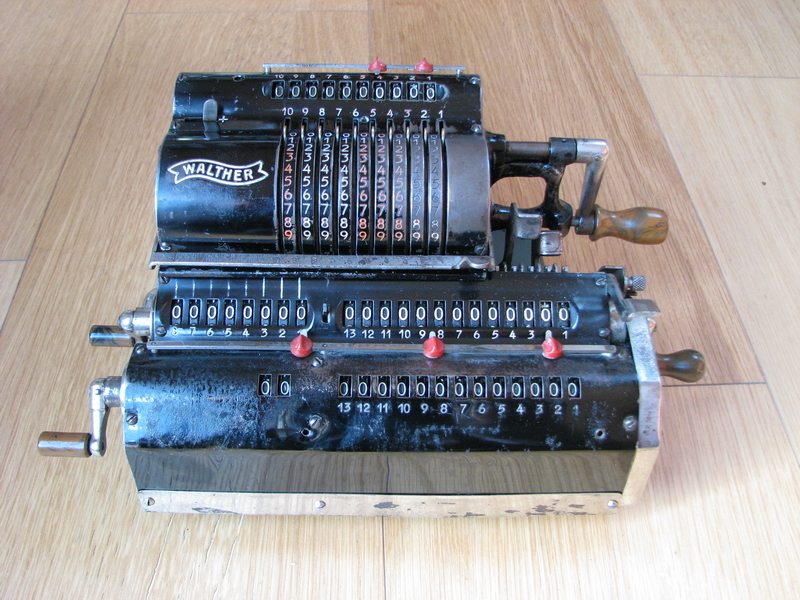 When looking up and towards the back, a normal numeral wheel will count 0-1-2-3... the ones in the memory bank count 0-9-8-7 ... so they are most certainly not interchangeable! 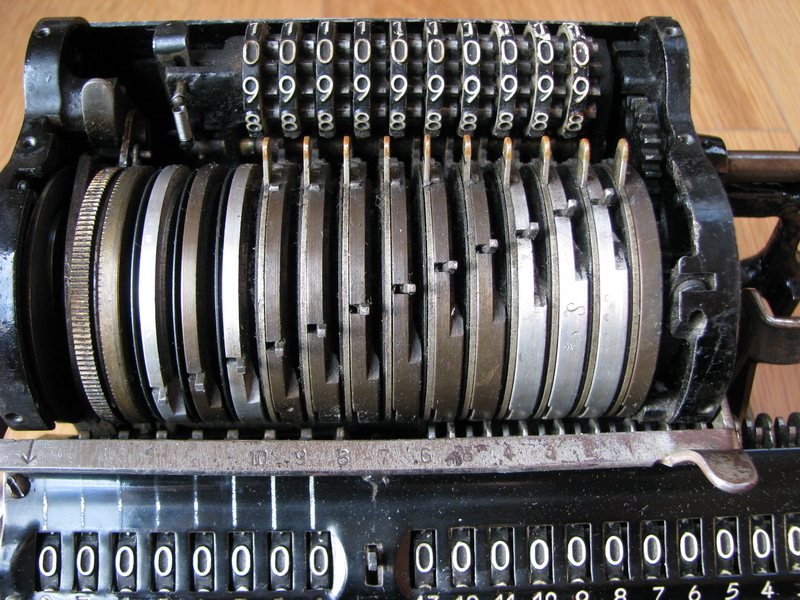 The tens' carry mechanism is very well hidden at the very dark dirty bottom of the memory bank, but it can be illustrated by the counting register in the memory. 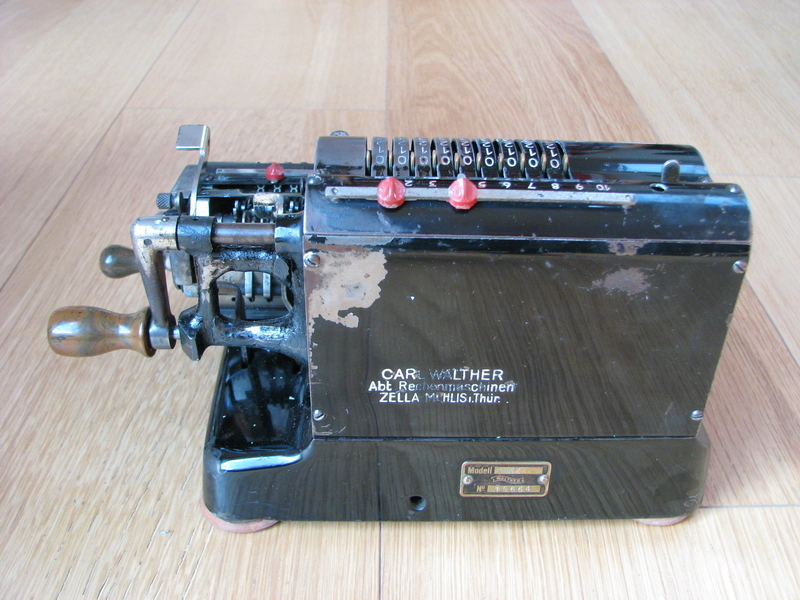 This is the front, showing two little levers per numeral wheel. In this picture the leftmost lever and the rightmost lever are identical. 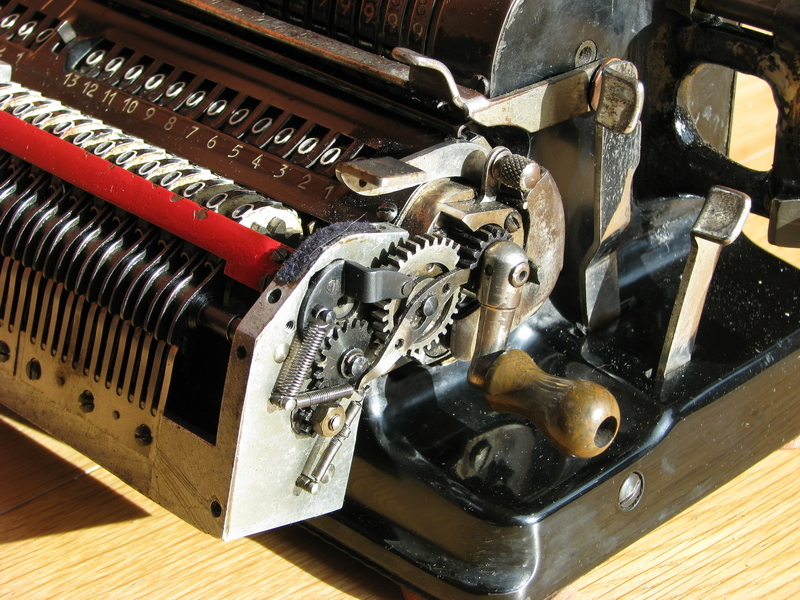 You can see how a tooth on the numeral wheel will push this lever back when it moves from "9" to "0". 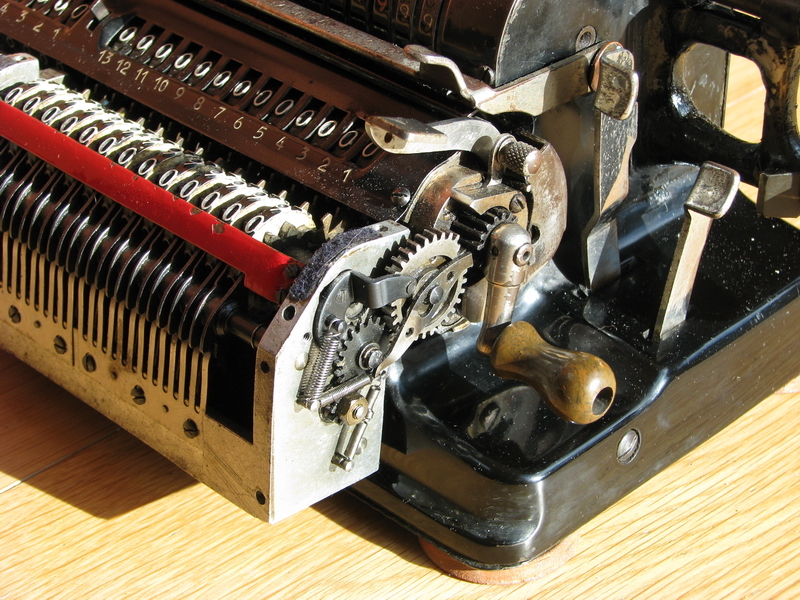 The lever then remains in the "activated" position, and interacts with the tens' carry shaft, which sits in the bottom of the memory bank...here. 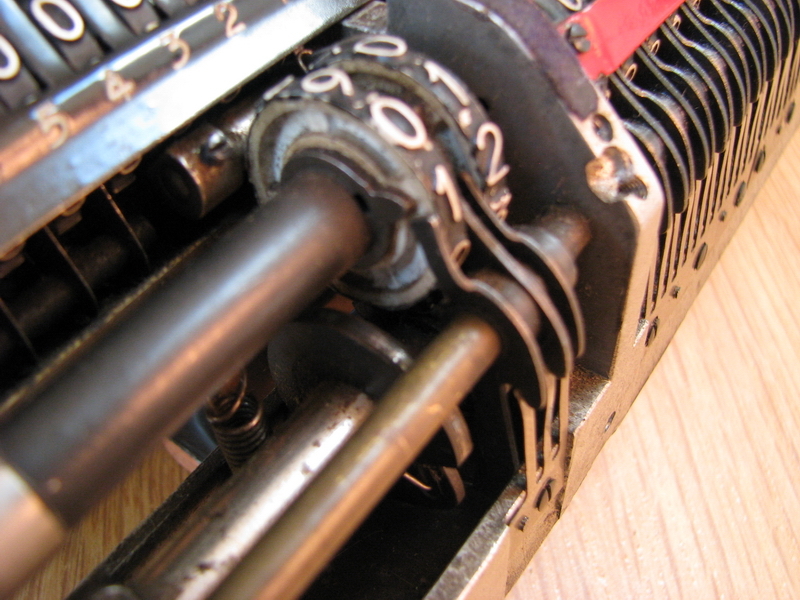 The effect is that the middle lever then pushes the left numeral wheel one digit forward, and right after unlocks the leftmost lever, which then returns to its unactivated state. 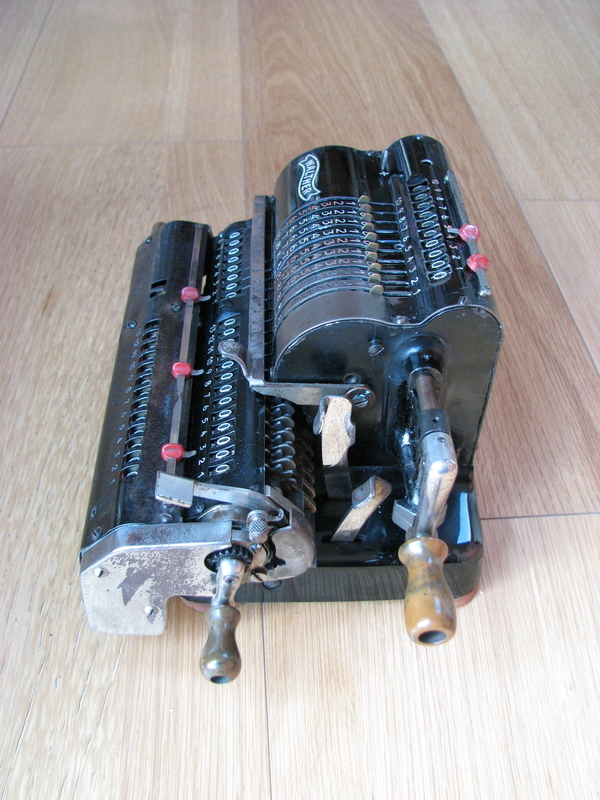 It is the same system as used in a normal carriage, except that there the release of the tens' carry levers and the presence of a carry tooth at the correct time is normally taken care of by the pinwheel cylinder itself, whereas here it is done jointly by the small tens' carry shaft in the bottom of the memory and the double levers in the front. Other interesting features are that the normal carriage shift wouldn't work with that great big lump of memory hanging off the front of the machine, so a solution was found by making it one-hand operated with thumb buttons next to the crank. 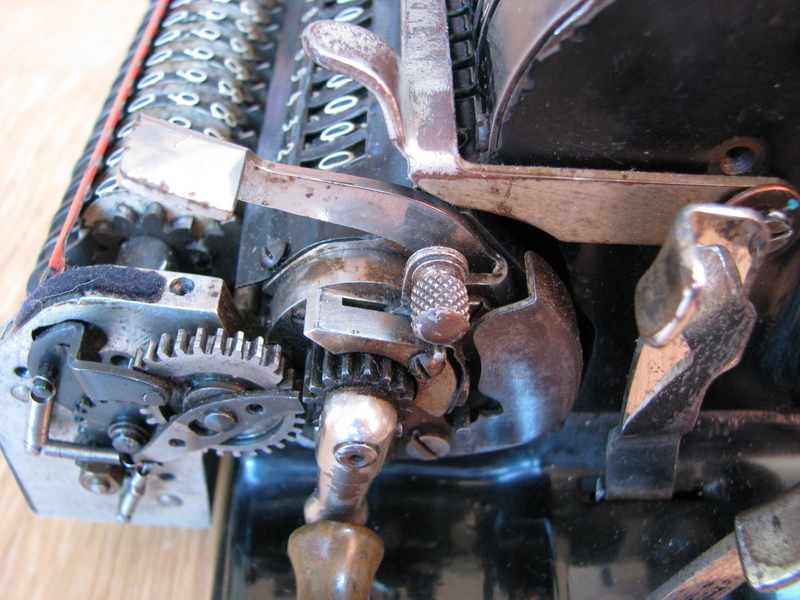 The carriage becomes spring loaded when shifting to the right with the long lever, and then very easily springs back to the left with the short lever. Another interesting feature is this tiny button, which, when flipped forward, blocks the carriage clearing. Why ? I honestly have no clue why that could possibly be useful. 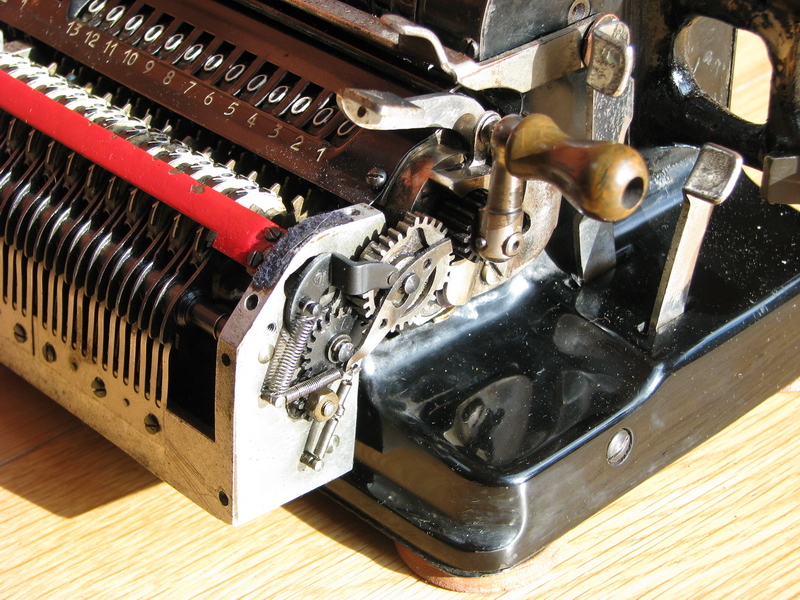 There are some other rather fishy repairs to this machine - for some mysterious reason three of the pinwheel disks and two of the tens' carry disks are made in aluminium, whereas the rest is brass. They function just as well, but one can't help but wonder how that came to be. And finally of course, transfer to the memory register doesn't really actually work properly. 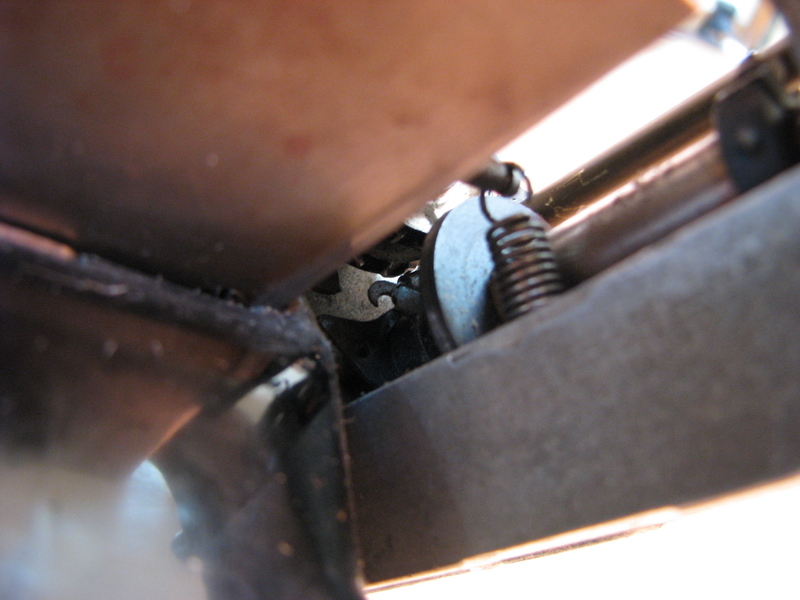 The mechanism as it is releases the memory from the "up" position a smidgen too early, which makes the raised part of the large gear just not engage with the gear on the clearing crank. Everything in the memory will then remain blocked, and the red shroud will remain up. The remedy for this is to slightly support the memory from the bottom so it stays engaged on the changeover from the low to the high part of the large gear, or keep pressing the large lever on top of the carriage to obtain the same effect. This cannot possibly have been the intention of the design, but I honestly don't see how this system could ever have worked properly. If anyone has a manual, I'd like to see a description of what the carrying operation is supposed to be like. The memory register, by the way, only counts up - there is no subtraction mode. I thought for a second that the tiny button discussed higher might have someting to do with it, but that does not appear to be the case. Apart from the missing comma slider bar on the memory, the machine now looks OK. I will make up a replacement comma slider bar at some point, and relocate some of the comma sliders.